After entering the muggy room and acclimating ourselves to the space (games along the walls, cookies and kegs in the middle), we started our self-guided tour at a table near the back windows where four dudes were cheering and jeering sporadically while hunched over an iPad on a teensy table. A small postcard was stuck to the wall behind them that simply said Orbit. The designer was on hand to give us a tour, showing us the simple yet engaging graphics and explaining what to do: "Collect the green stuff, avoid the red stuff and try to hit each other as much as possible". 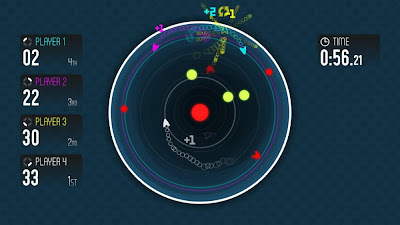 Basically, you play as a colored ship, which you control by using a similar hued button on one corner of the iPad. 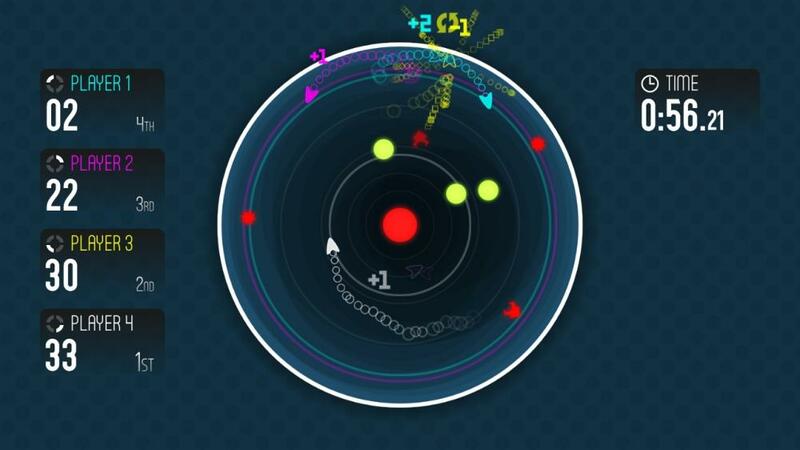 Holding the button will turn your ship around in circles, while letting go moves it in a forward trajectory. A central planet is available for ricochet movements, but I have to admit, I spent most of my time spinning in orbit. Points are rewarded for crashing into each other, so it's really all-for-himself here, but nothing creates a bond between gamer strangers quicker than some affectionate trash talk. Fast paced and wicked fun, I am sure there are some future drinking sessions in the world that will include rounds of Orbit. More information can be found at Caffeine Monster Software's website. Next we wandered over to where Shadow Planet Productions was showing their beautiful, dual-stick side scrolling adventure, Insanely Twisted Shadow Planet. I tried a demo of ITSP at PAXEast and was impressed by the graphics, but failed spectacularly at actually playing the game. I don't think my left and right hands can communicate as quickly as they ought to in order to play this one successfully. So although I admired it for it's bright colors and equally dark shadows, I had my doubts about actually acquiring it next month when it releases on XBLA. At SIX, however, a second television screen was available for the multiplayer demo. Matt & I sat down with one of the reps and played part of a level together, which was still had the same dual-stick frantic qualities, but was a much more enjoyable experience for me than it was at PAX. With partners to assist, I didn't feel quite so burdened by my own limitations. One of the tasks each player is given is to pull a large colored lantern with them to each battlepoint, which illuminates the space. If all three (or four, one for each player) go out, then the game is over. Between shooting things with one mode, switching to carry or grab with another and simple moving forward, your fingers definitely need an education before starting this endeavor. It was great fun, and I was quite relieved. Even though these types of games have the potential to end in loving frustration, I think Matt & I will enjoy some multiplayer action -- I will probably leave the single player campaign to him, however. Insanely Twisted Shadow Planet releases on XBLA on August 3rd. Read more about it on the website. The last title we were able to try was Haunted Temple's Skulls of the Shogun, another game we admired at PAXEast, but never actually experienced due to the long lines and claustrophobic qualities of the Expo Hall. During a point in the night where a raffle was being drawn, Matt & I snuck over to the now vacant space abandoned by hopeful prize winners and got to play a full campaign against each other. The designer let us try a 'winter' level that was still in progress and I got to show him my button from PAX. Aw. Anyway, I really dislike tactical games. Matt adores them, so I've spectated during lots of Valkyria Chronicles sessions and the like, but taking on something akin to a battleland chess game one careful move at a time? Snor-ing. But Skulls of the Shogun takes a tactical game and infuses it with mechanics that aren't so painstaking and graphics that are cartoonishly adorable, which gives it a sort of precious element and makes it digestible for even a naysayer like me. During the half an hour of play we consumed (I am kind of ashamed of this, since we totally bogarted the demo for so long, but...nah) I smiled, I laughed, I taunted Matt, I haunted temples, I created a raven character that stole resources (rice) and gusted wind, I nommed skulls of fallen soldiers, I moved little samurais with arrows and pikes around a brightly colored, adorably animated landscape and was totally still talking about it later that night. Even while I was getting massacred by my loving fiancee, Skulls of the Shogun was absolutely winning me over. Announced recently as being a future XBLA title, a release date is still pending but tentatively scheduled for January. More information can be found on the website. Big thanks to the participants for another great Seattle night. Seriously, why doesn't everyone live here?